Get a great price on the Augvape Druga Foxy from Vapor DNA. The Druga Foxy comes in a black cardboard box with the Druga logo and the full name of the device etched in gold, and a clear cutout offering a view of the actual mod inside, on the front, and a simple scratch-and-check authenticity sticker, on the back. Usually, you’d see a list of kit contents, some technical specification, or at least some information about the manufacturer on the back of the box, but Augvape apparently decided to stick to the simplicity theme on the packaging as well. Inside the box, we have the lovely-looking Druga Foxy box mod sitting snug in a Styrofoam holder, and underneath it is a small user manual. And that’s it, that’s all there is in the box. I for one expected to find at least another micro-USB cable, but the Foxy doesn’t have on board battery charging, so you don’t even get that. While we’re on the subject, if you’re interested in this mod, you’d better invest in an external battery charger if you don’t already have one. The Druga Foxy by Augvape measures 93mm x 49mm x 26mm and is made primarily of zinc alloy. It currently comes in just two color variants, gun metal and silver, each with different paint finishes (the gun metal has a brushed finish, while the silver is extremely glossy). The general design of the Foxy can best be described as minimalistic. It’s a classic compact dual-battery mod, just one that’s lacking in noticeable features or bells&whistles. 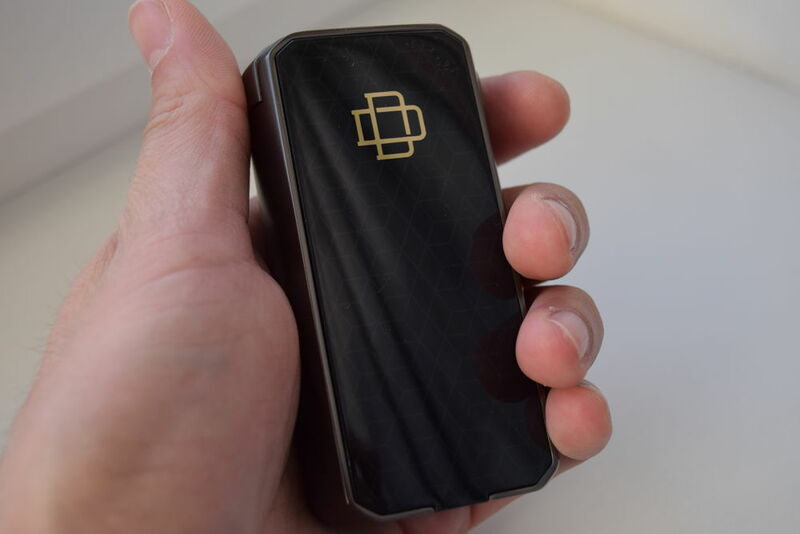 Apart from the small fire button on one of its narrower sides and the gold Druga logo on the battery door, there’s really nothing else that stands out. It makes it look like a sturdy yet very elegant block of metal, and even though that’s an illusion – the panels on each side are made of plastic – it’s a very visually appealing one. This is hands down one of the most-good looking vape mods I have ever tested, and there have been a few. The Druga brand hasn’t exactly been synonymous with build-quality and elegance – at least not judging by that plastic squonker and run-of-the-mill RDA that I know of – but the Druga Foxy may just be a turning point. This thing is downright gorgeous. I’m not even going to mention personal taste here, if you like nice things, you’re going to love the look and build quality of this device. 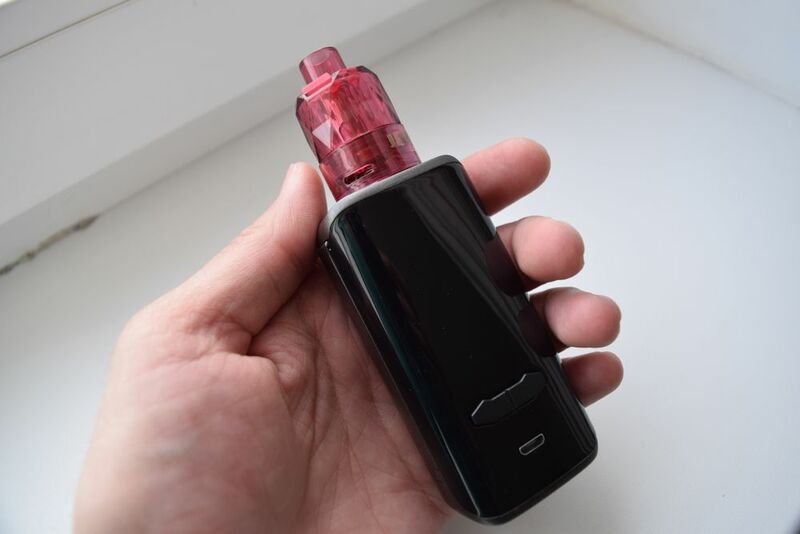 Starting at the top, we have a 510 connection with a spring-loaded, gold-plated pin and a protective stainless steel plate around it so you don’t scratch the paint when you attach the atomizer. The plate has “Quick Release” etched into it, which is that innovative feature I mentioned in the introduction. Basically, the threading of the 510 connection is made up of two pieces, one of which can be pushed back by pressing the metallic button opposite the fire button. It’s right next to the connection, so there’s virtually no chance anyone will mistake it for the fire button. So how does Quick Release work? Well, usually, you have to screw and unscrew an atomizer in order to use it. That takes a bit of time, plus tanks sometimes get stuck, requiring significant pressure to detach from the mod. The feature thought up by Augvape’s designers makes this a non-issue and makes attaching and detaching atomizers faster and easier. 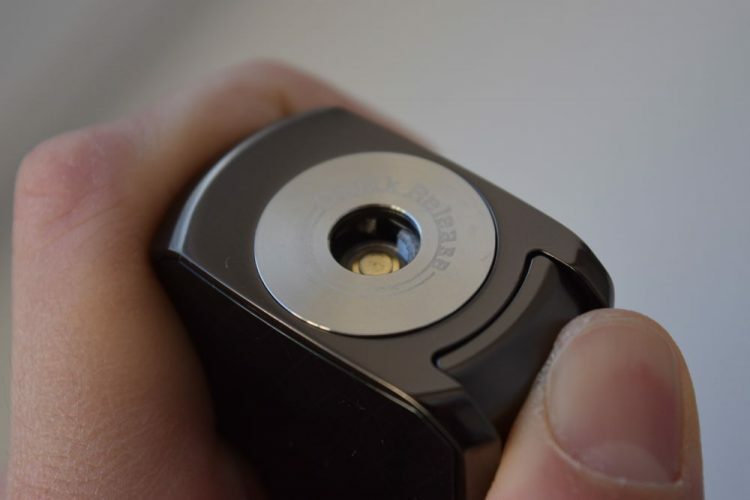 All you have to do is press that Quick Release button on the side of the mod firmly to open the threading of the 510 connection. Then just put the atomizer on the mod (without screwing it on), release the button, and check if it is firmly attached. Sometimes it will require a half rotation to lock firmly in place. Detaching the atomizer is a bit trickier. I’ve already seen a few reviewers bashing Augvape for what they’re calling poor implementation, but the truth of the matter is they don’t really know how Quick Release works. 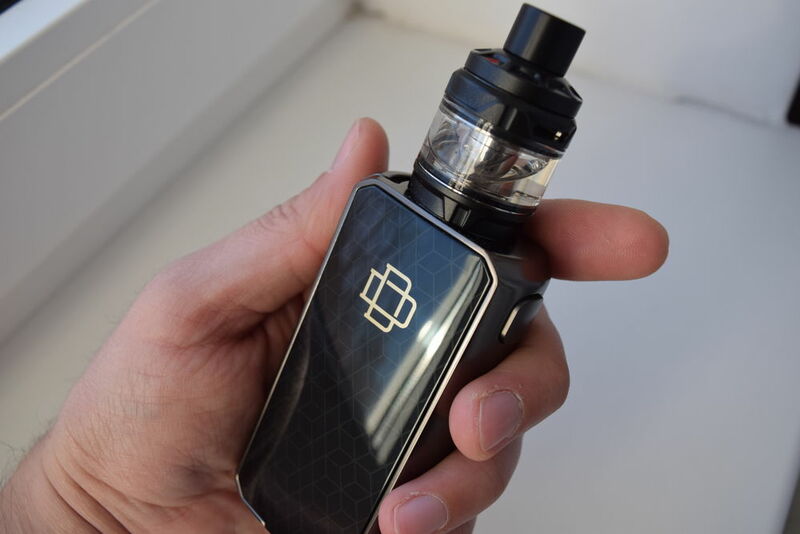 In order to detach an atomizer from the Druga Foxy, you don’t just push the button and yank off the tank. Instead, after pressing the button all the way through, you have to unscrew it for half of a rotation before pulling it off. As far as I am concerned that is a safety feature, not poor implementation. Without that half rotation, your tank could easily detach at the wrong time, if you accidentally pressed the Quick Release button. You could break the glass section or dent your RDA, and nobody wants that. I’ve been playing with the Quick Release feature for about three weeks now, and as far as I am concerned, it works as intended. You just have to read about how it works before complaining about it. Can it be improved? Most definitely. Is it really necessary? Definitely not, in fact, you can screw your atomizers on and off the old fashioned way, if you don’t like it. But one thing no one can argue is that it’s innovative. 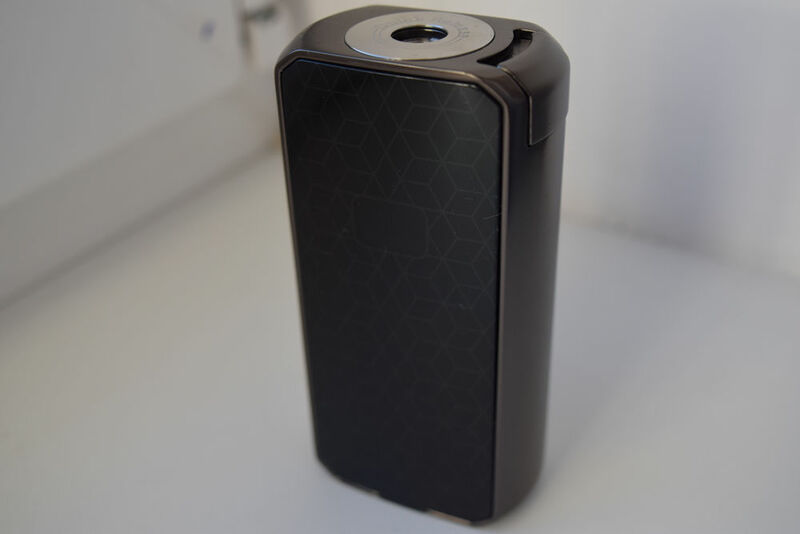 The Druga Foxy features two plastic panels on each of its two wider sides. One of them acts as a battery door, while the other is simply a cover for the control panel. They both look really nice, although they are on the glossy side and thus prone to fingerprint smudges, but I wish they didn’t feel so flimsy. You can’t really tell when they are attached to the mod, because they are kept firmly in place by powerful magnets and because the weight of the device is very deceiving, but once you take them off, you can see they are just flimsy pieces of plastic. I wish they had some sort of metal reinforcement on the back, to be honest, for a sturdier feel, but I have yet to damage them so I can’t really complain too much. The battery compartment is well thought out, apart from the ‘+’ and ‘-‘ polarity indicators, you also have actual battery symbols with the ‘+’ facing the right way, in both battery trays, and the whole space is properly insulated with plastic, so there’s no risk of shorts. Tho other panel conceals the cool control panel of the Druga Foxy. I can’t tell you how surprised I was when I first took it off and saw a mathematical representation of Ohm’s Law painted on the mod. I’m not a math guy, never have been, but I can’t deny that it looks impressive to the point where I want to use it without the protective panel. Here you’ll also find the ‘+’ and ‘-‘ buttons, as well as a tiny display. You may think it’s too small, but I think it’s by design, to maintain the minimalist design of the mod. One think I can complain about regarding the screen is how dim it is through that tinted decorative panel. It’s quite bright without it, but once you put that thing on, you can barely see it, and in bright sunlight its’ virtually impossible to see any of the information on the display. Ok, this section of the review is going to be unusually short, because there’s really not much to talk about. To turn the Drug Foxy mod on and off, all you have to do is press the fire button five times in rapid succession. To go into the menu… Oh wait, there is no menu. 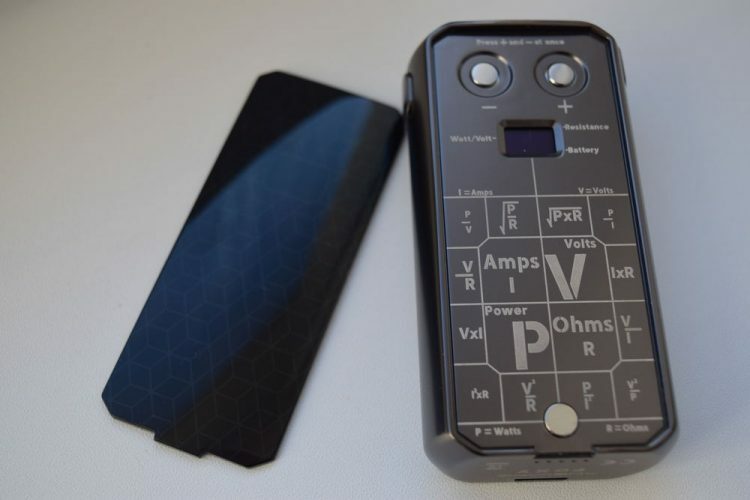 All the Foxy allows you to do is switch between wattage mode and voltage mode, and that can be done by pressing the ‘+’ and ‘-‘ buttons simultaneously. That’s it, that’s all there is to this mod. There’s no temperature control, no TCR or custom curves mode, not even a preheat option. The simplicity theme covers both the outside and the inside of this device, apparently. The lack of features and limited functionality is not a con in this case, as they are all by design. 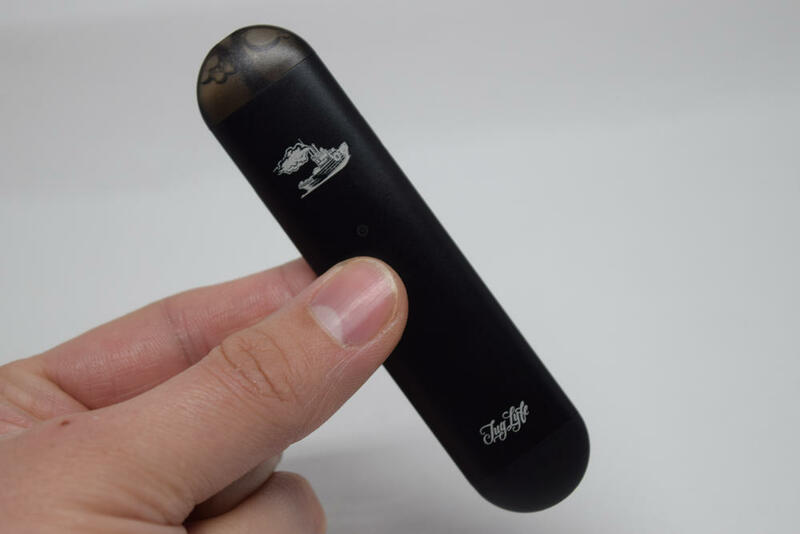 This is a vintage-type device that pays homage to the early advanced mods that started the technological revolution in the world of vaping, and it does so elegantly. I personally will not fault it for that. If you don’t like it, or feel that you need something more, there are plenty of options to choose from on the market. In this section I normally discuss battery life and charging, but that doesn’t apply to Augvape’s Druga Foxy, as it doesn’t even have on-board charging. 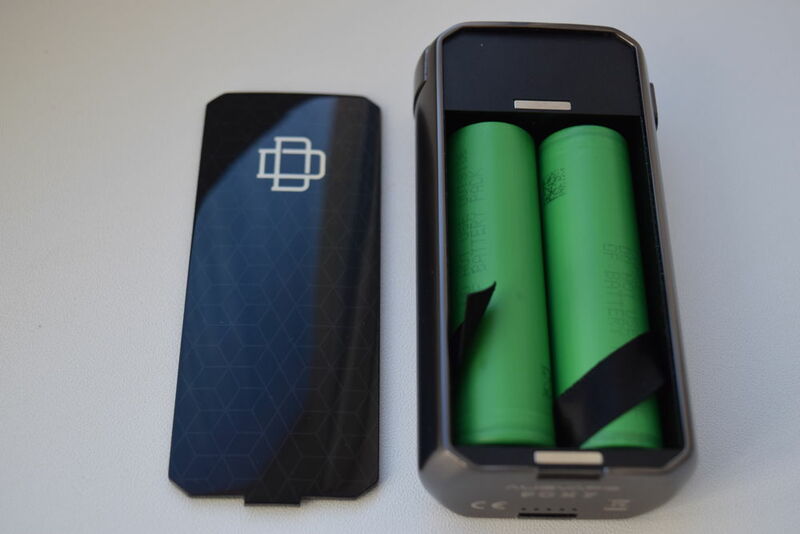 You’ll have to charge the two 18650 batteries externally, and your battery life will depend on a variety of factors, including the capacity of your batteries, the power output and how much you vape. The Druga Foxy may not have as many modes and features as other advanced vape mods, but when it comes to raw performance, it does not disappoint. 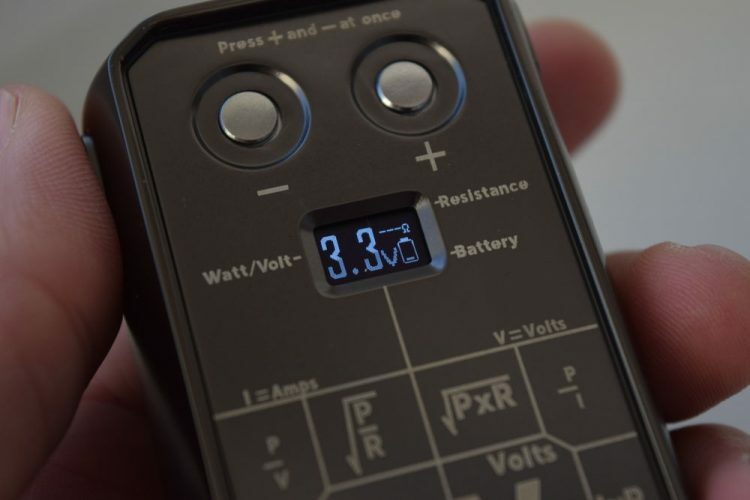 Firing speed is as impressive as that of the Augvape V200, as is the power ramp-up. I’ve mainly been using it in wattage mode, as I’m more familiar with it, but it’s just as powerful in voltage mode. 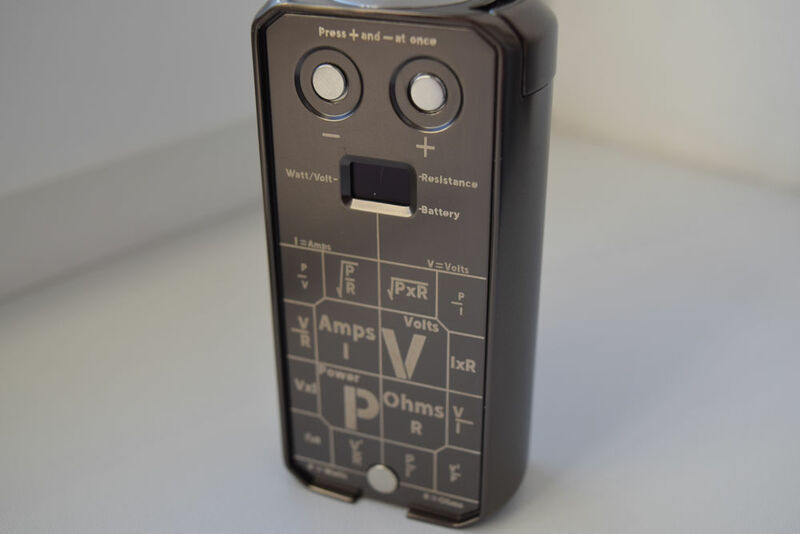 Now, if you’re interested in temperature control and custom power curves, or even if you prefer to experiment with pre-heat options, you’ll probably by disappointed by the simplicity of the Foxy, but if raw power is what you’re interested in, this device is really quite impressive. 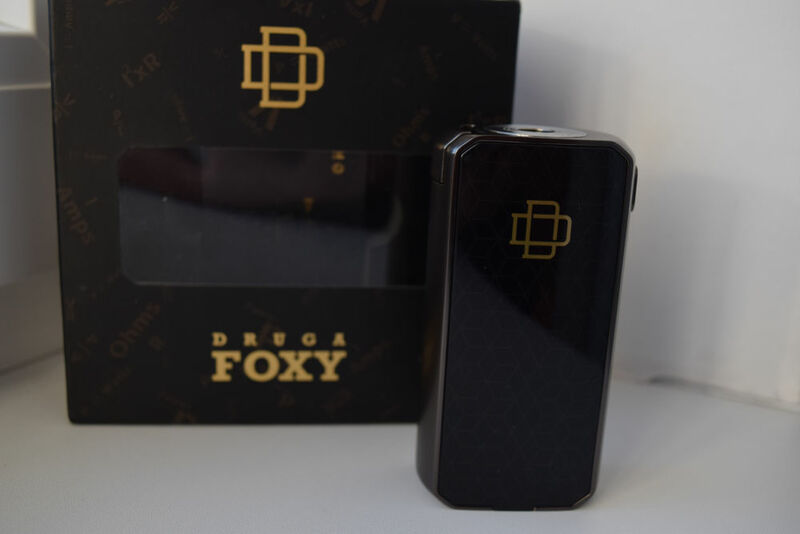 The Druga Foxy has a maximum power output of 150W/6.5V, which should be more than enough for most vapers. It fire down to a resistance of 0.05Ω and up to 3Ω. The Druga Foxy 150W box mod is not for everyone. If you’re looking for a feature-rich vaping device, this isn’t it. Apart from variable wattage/voltage, there’s really nothing else available. However, if you’re ok with that, you get to enjoy one of the best-looking and sturdiest vape mods I have ever tried. The Quick Release feature is worth mentioning mainly because of its innovative nature, but in terms of real-life use, I for one don’t think it’s that big of a deal. Maybe we’ll see it in the future, and maybe some other companies will start introducing it on some mods, but I don’t see it as a game changer. All in all, this is a device I’m happy to have in my collection.